"In the electric [signal path] side we come in and hit the Dunlop Wah system first and then out of there we actually come up to this little satellite pedalboard," says John Petrucci's guitar tech. Slash uses a Dunlop Cry Baby DCR-2SR Rack Module. Syn uses this in conjunction with two expression controllers set up on the stage (one on his pedalboard, and another set up "a little off stage left"). It appears to be set to a pretty standard wah sound, and the multiple pedals allow for a bit more mobility and flexibility. Brian May uses the Dunlop Cry Baby DCR-2SR Rack Module at 10:13. A Dunlop Cry Baby rack module can be seen at 16:22 in this rig rundown. 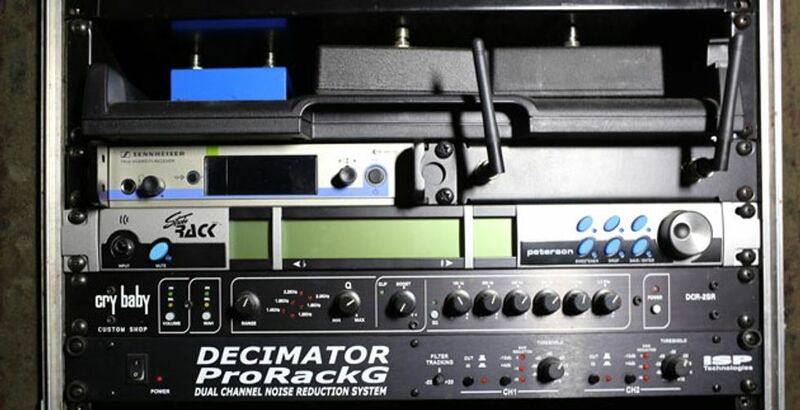 A Dunlop Cry Baby DCR-2SR Rack Module sits on top of Jason's [Line 6 Echo Pro Digital Modeling Processor](http://equipboard.com/items/line-6-echo-pro-digital-modeling-processor) at 18:46 of this "Rig Rundown". At 3:18 in this video, a picture of Devin's gear can be seen. The set-up includes a Cry Baby Rack Wah unit. 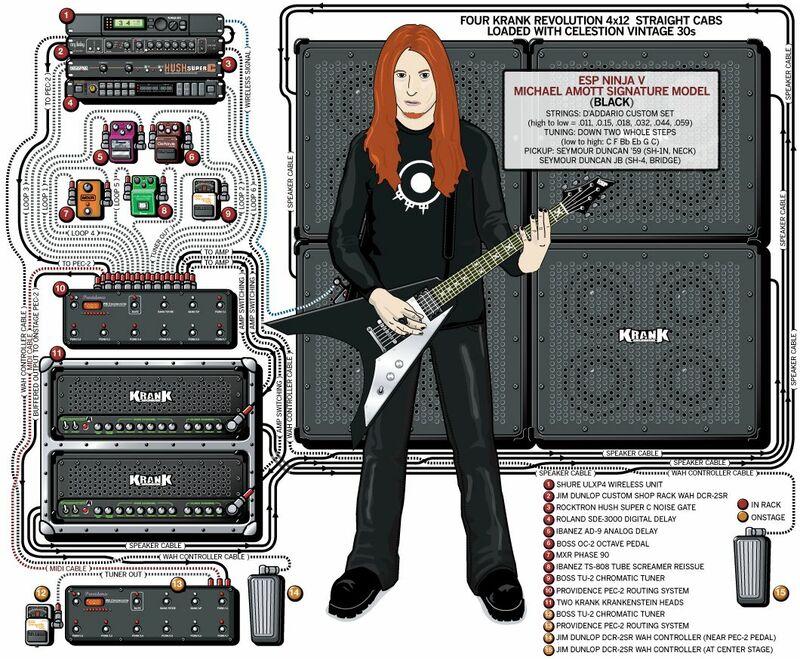 Aldrich uses a Dunlop Cry Baby rack module, according to [this](http://www.guitargeek.com/doug-aldrich-whitesnake-guitar-rig-and-gear-setup-2009/) Guitar Geek rig diagram. At 16:10 in this Rig Rundown for Richard Fortus of [Guns N' Roses](http://equipboard.com/band/guns-n-roses), and [The Dead Daisies](http://equipboard.com/band/the-dead-daisies), his gear is shown, displaying a Dunlop Cry Baby Rack Wah Unit. This article shows photos of Steve's rack including this Crybaby. According to Morrison's artist page on Dunlop's artist site, he uses a Rack Wah unit. At 7:08 in this "Rig Rundown" with *Premier Guitar*, we're shown Alex's Cry Baby rack effect, which runs into his [Mesa Boogie amp switch](http://equipboard.com/items/mesa-boogie-high-gain-amplifier-switch). There is a clear shot of Frampton's Cry Baby Rack at 0:40 in this video. "Depending on the venue I’ll use the rack mounted Dunlop Wah or a Zakk Wylde…"
In this video, Fredrick Åkesson mentions he uses the Cry Baby Rack Module at (3:06). 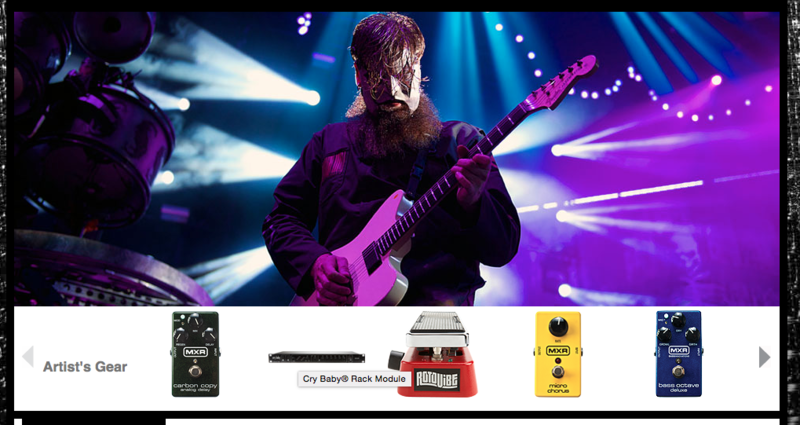 Jim Root uses a Dunlop Cry Baby DCR-2SR Rack Module, according to [Dunlop's website](http://www.jimdunlop.com/artist/jim-root). 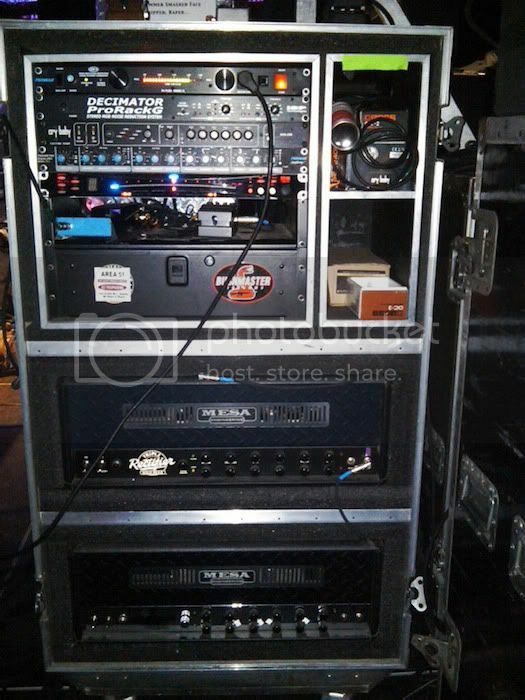 One item on Mick's rack unit is a Dunlop Cry Baby DCR-2SR Rack Module. [Source](http://www.jimdunlop.com/artist/mick-thomson). The current rig – three Bogner Ecstasy 101 B Heads, one Hiwatt DG103 head, TC Electronics D-Two, Fireworx, Reverb 4000, Fractal Audio Axe-FX II, RJM IS-8 Amp Gizmo and Rack Gizmo, DLS RotoSIM and Versa Vibe, Exotic EP Boost, Dunlop Rack Wah, Earnie Ball Volume Pedals, Shure UR4D wireless, Fryette power amps, Midas Venus 160 mixing console. Bogner 4×12 an 1×12 speakers, and VooDoo Lab Ground Control Pro controllers. As shown on gear list. Just under the multi-selector, Tony shows his rack wah unit by Dunlop. *Guitar Geek* created a diagram of Herman's rig set up, which included a Dunlop Cry Baby DCR-2SR Rack Module. According the Jim Dunlop Website, Phil uses an Dunlop Cry Baby DCR-2SR Rack Module. Pat's rig which includes a Dunlop Cry Baby DCR-2SR. This gear diagram of Michael's stage setup includes a Dunlop Cry Baby rack module. Robin Finck uses a Dunlop Cry Baby DCR-2SR, according to [this](http://www.guitargeek.com/robin-finck-nine-inch-nails-guitar-rig-and-gear-setup-2014/) detailed gear diagram of Robin Finck's Nine Inch Nails stage setup. 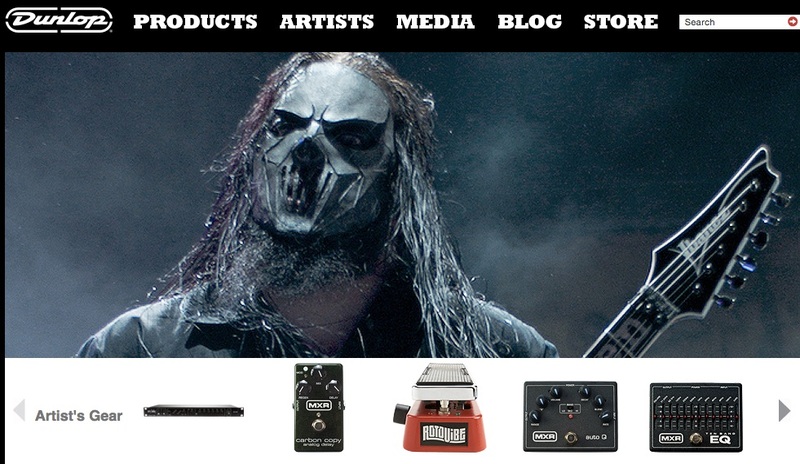 "A Dunlop Cry Baby Rack Module DCR2SR wah is next, followed by a Radial Twin-City Active ABY amp switcher," reads [this](http://www.premierguitar.com/articles/21840-rig-rundown-gwar-2014) rig rundown on Brent Purgason, by Premier Guitar. No reviews or videos yet for Dunlop Cry Baby DCR-2SR Rack Module. With an Equipboard account you can rate this item, add it to your collection, submit a review to discuss what you like and dislike about it, and associate Dunlop Cry Baby DCR-2SR Rack Module to artists that use it. Create an account!